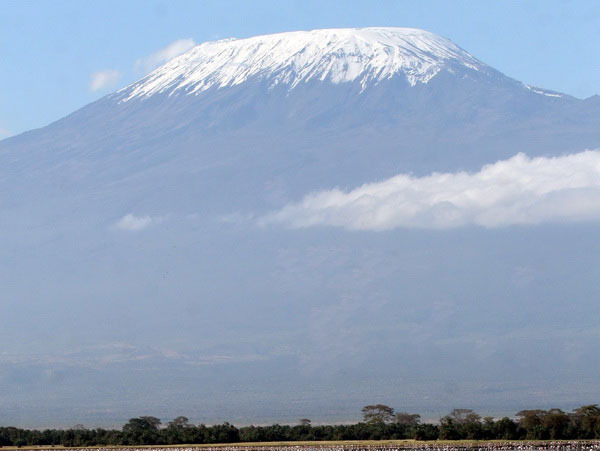 Once championed as the discerning wilderness route for climbers, Mount Kilimanjaro’s Machame climbing route is gaining on Marangu in terms of popularity. It’s also the second-most accessible trailhead of the non-steep routes making it attractive to clients. 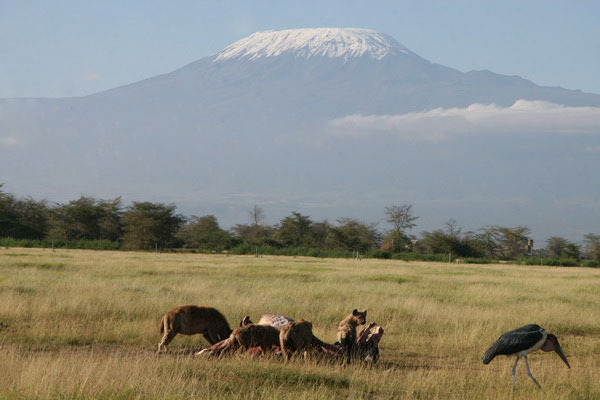 Its reputation as one of the most scenic routes is entirely justified, with the sweeping views across the Masai Steppe to Meru and the impressive Barranco Valley praised by all who climb it. Gains in popularity, however, are inevitably at the expense of total exclusivity but as the descent route is different from the ascent, climbers are only aware of the popularity when they reach camp; it is still infinitely quieter than the Marangu Route. • Climbing equipment such as clothes, sleeping bags etc. • All other expenses resulting from early descend before the completion of the climb such as transfer, extra nights etc. Pick up from your lodge after breakfast and transfer to Machame gate where you will register before you start your climb. 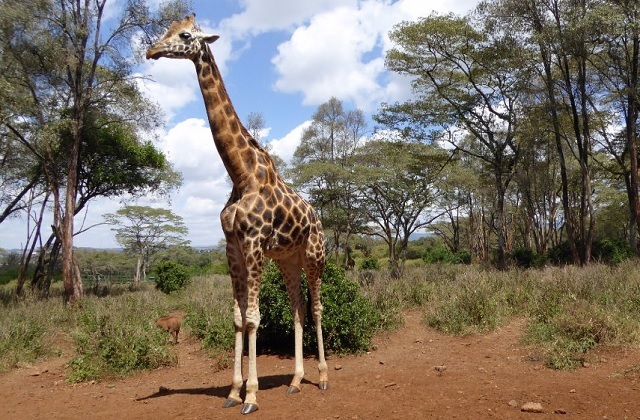 From the park entrance gate (Machame), you will trek for about two to three hours through a dense forest of fig and rubber trees, begonia flowers, and other tropical vegetation. A stop for a hot lunch will be made halfway to the campsite. As you continue your ascent, you will find that the tropical forest has given way to tall grasses and giant heather. You will be walking on a ridge, to the left of which is the Semira stream, and on the right, the Weru Weru. 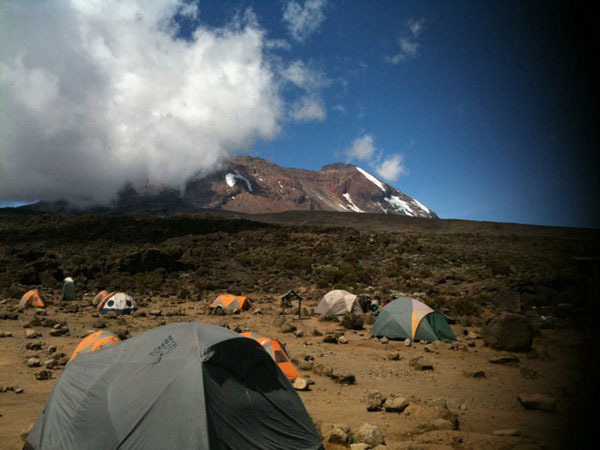 Depending on the pace of the climbers, arrival at Machame Camp is usually between 5pm and 6pm. This initial stage of the climb is tranquil and relatively easy. There is no point in rushing to get to the camp, as there is little to do there. 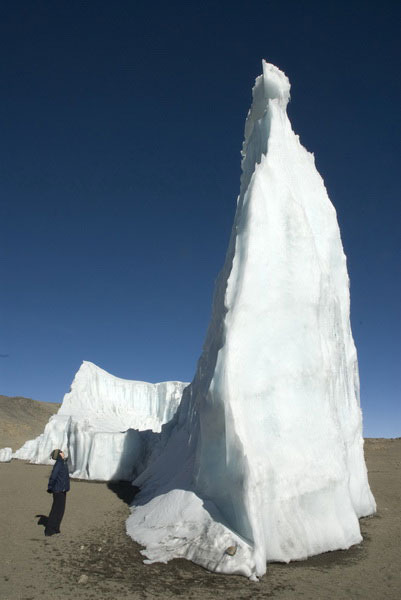 Guides tend to recommend a slow ascent, even at this point, for gradual acclimatization. Do not try to keep up with your porters, who will usually bound ahead. Instead, take time to admire the beauty of the rainforest. If you are interested in botany, you should carry a small reference book. On this and subsequent mornings, wake-up call is at around 6am and is accompanied by hot tea or coffee and typically a fabulous view of Uhuru peak. Today's trek takes you up a steep track through a savannah of tall grasses, volcanic rock, and bearded heather. 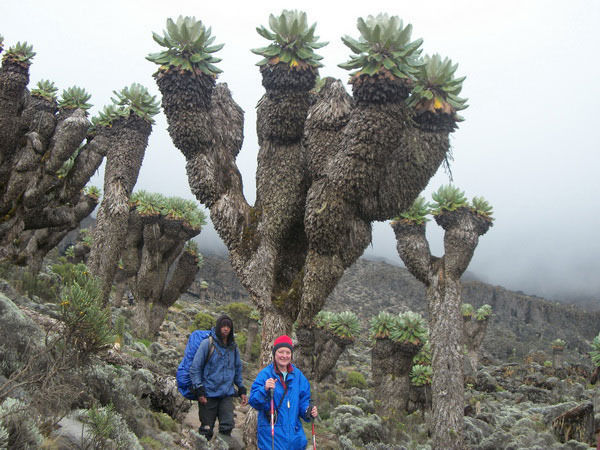 You will encounter giant groundsels as you hike through a ghostly landscape of volcanic lava, caves, and foamy streams. Lunch will be taken just below the Shira Plateau, about three to four hours from Shira Camp. The hike to the next campsite takes approximately six hours and you should arrive between 2pm and 3pm. Most climbers tend to pace themselves, walking slowly and resting about every half-hour. Many will feel lethargic and have headaches by the time they reach camp. 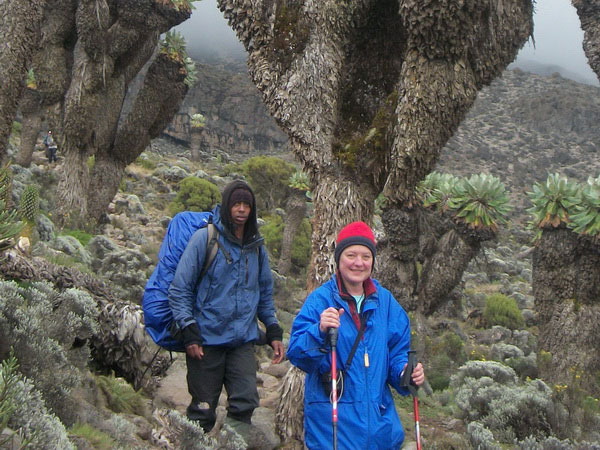 Guides advise those with symptoms of altitude sickness to drink tea and sleep a lot. Dinner and overnight at Shira Camp. After breakfast you will start crossing the Bastains stream and commence the descent to Barranco Camp along the immense Grand Barranco canyon. Along the way, you will see numerous waterfalls, which are fed, by streams coming from the mountain, converging here to form the Umbwe River. 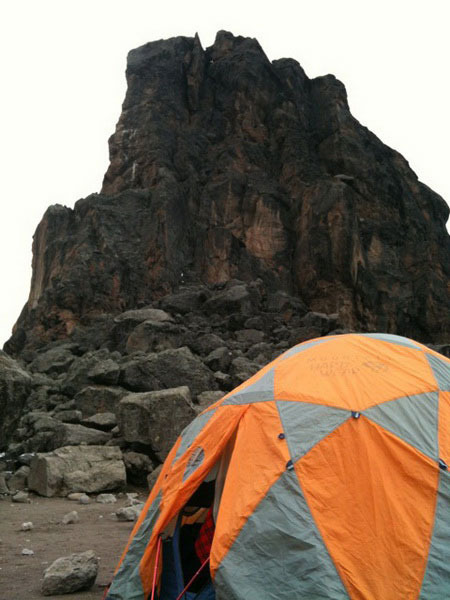 Your camp is set at almost the same altitude as the night before. 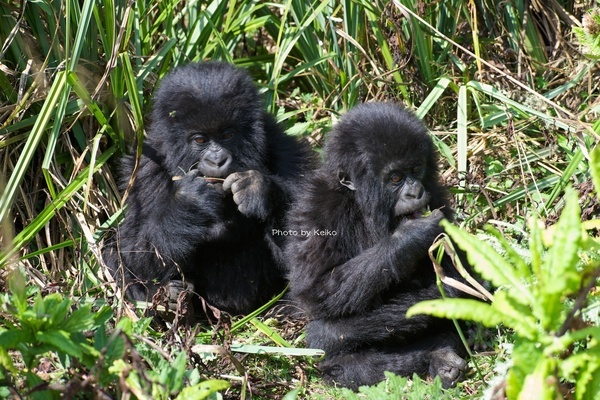 Today's trek lasts for about six hours and arrival at camp is between 4.30 and 5.30pm. Dinner and overnight at Barranco Camp. You will be awakened at midnight and after a light breakfast, start climbing at around 3am. At this stage, the climb becomes much more difficult. 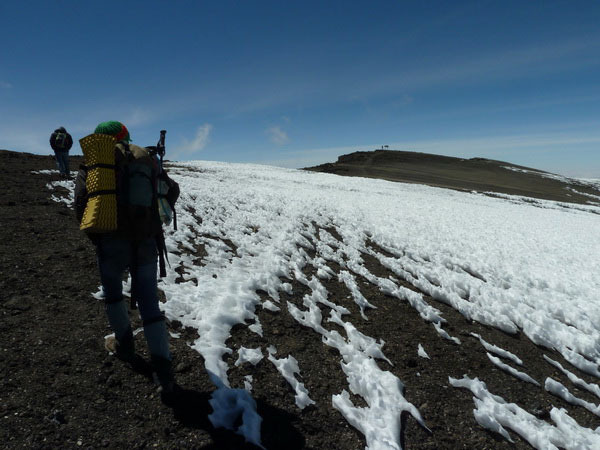 Here, very few will not be suffering from altitude sickness in some form or another; and climbers should carry as little as possible on this portion of the climb. Temperatures will range from -4° to 5° Fahrenheit. Making your way up a path that is flanked by the Ratzel and Rebman glaciers, you will climb for about six hours before reaching the edge of the crater, between Stella and Hans Meyer points. Another hour of climbing brings you to the summit. 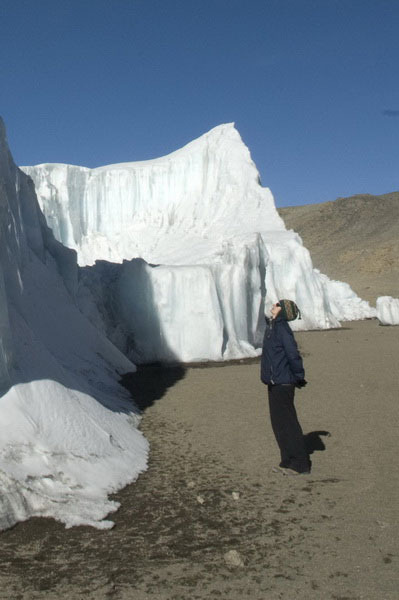 Uhuru stands at 19,340 feet and is the highest point on the continent of Africa. 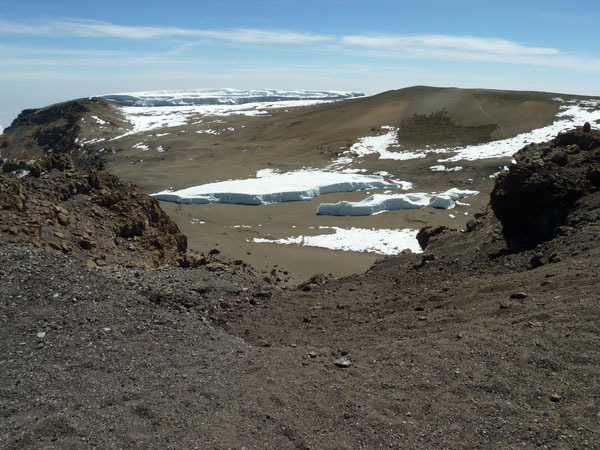 The track around the edge of the crater is rocky and icy. Concentrate on your feet, and follow your guide very closely for this portion of the journey. The descent is now easier than the ascent. 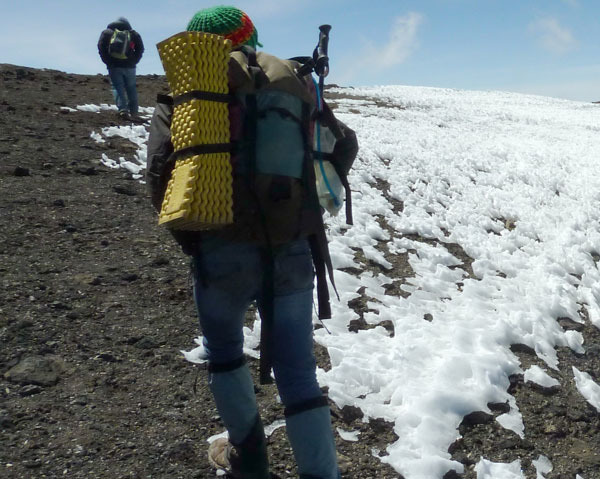 You will reach Barafu Camp after about three hours at around 11.30am. Arriving into camp at around 5pm you will have trekked a total of thirteen hours today. Dinner and overnight at Mweka Camp. 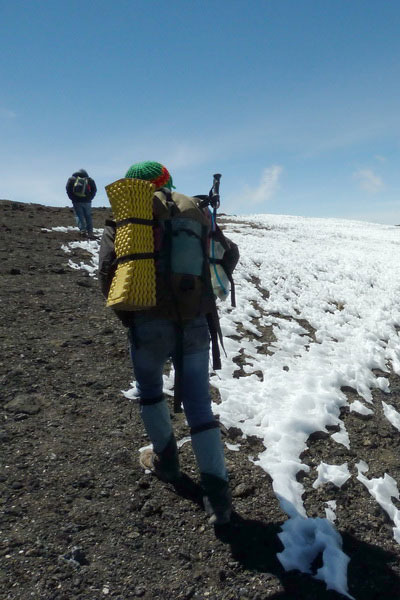 The Machame route starts from Machame Gate and travels upwards through the montane rainforest, characterized by dense vegetation, a muddy trail, and short sections of steep climbs. The first campsite, Machame Camp, is right after the dense tree cover in an area with lower but still thick bushlands. 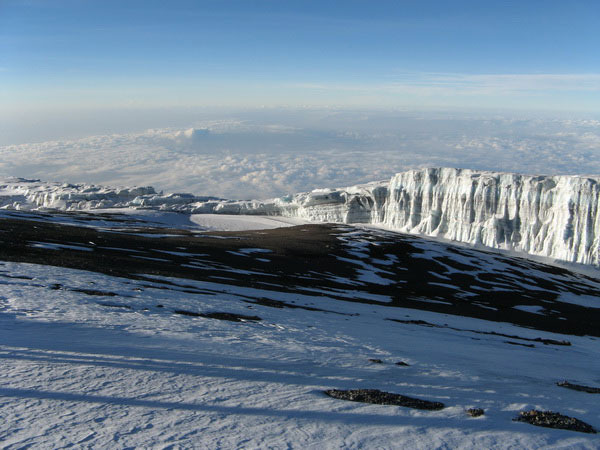 Is on a small plateau in the high moorlands, and features views of Kibo in the northwest and Mount Meru towards the east. White necked ravens can be seen throughout the day. There is also a set of small caves a short walk from the campsite known as the Shira Caves.